On August 18, 2018, about 1700 central daylight time, a Cessna 172S, N893JA, impacted terrain on an adjacent taxiway shortly after takeoff at Addison Airport (ADS), Dallas, Texas. The pilot was conducting a discovery flight with two passengers on board. The airplane sustained substantial damage to the airplane fuselage, wings and empennage. The commercial and flight instructor-rated pilot and two passengers were seriously injured. The airplane was registered to Mat-Valley Aero Services LLC and operated by US Sport Aircraft under the provisions of Title 14 Code of Federal Regulations Part 91 as a discovery flight. Visual meteorological conditions prevailed for the flight, and no flight plan was filed. Rhonda Reeder with Post Acute Medical presents Steven Salazar with the photo that will hang on the rehab hospital's Wall of Honor. Salazar was in a plane crash in August 2018. Steven Salazar was close to his dream of becoming a regional airline pilot when he was seriously injured in an accident involving a Cessna C-172. Although he had survived the crash Aug. 18, he couldn't help but feel as if the life he had worked so hard to build as a flight instructor in Dallas was stripped away from him. The 26-year-old recalled the anger and disappointment he felt inside the rehab hospital room back in his hometown of Victoria. He underwent surgery for a broken back and broken bones in his legs. He also suffered nerve damage. He grew accustomed to his new routine, and the hospital became his second home. While his body healed its shattered bones, his dog, Cooper, a mini Australian shepherd, was allowed to visit every evening. Another daily visitor was his grandfather, Robert Rodriguez. And after he was discharged, Rodriguez drove him to Post Acute Medical Rehabilitation Hospital of Victoria for outpatient therapy five days a week. "He has been my right-hand man, my caretaker, my motivator, my personal comedian, my cameraman during physical therapy, my chauffeur and the best grandpa I could ever ask for," he said Friday during a ceremony celebrating his induction into the Wall of Honor at PAM Rehab Hospital. Soon a framed photo of Salazar smiling next to a plane will join four others on the wall, each patient with their own inspiring story of recovery. At the lectern, before the cake was served, he said recovery would have been even harder without his strong support network. His parents, Barbara and Frank Salazar Sr., said there was no doubt that their middle child would get through this. "He's always been one for adventure," she said. "Nothing holds him back." "Once he gets his mind on something he does it," added his older brother, Frank Salazar Jr.
Steven Salazar recently completed a Jingle Bell 5K Run sponsored by the hospital and afterward helped pack 150 care packages for military troops. "He was always here working his tail off," said Dion Ruiz, his physical therapist at Post Acute Medical. "He is the perfect patient because he really buys in to what we tell him and he trusts us." Salazar still has physical therapy and is working to improve his gait. 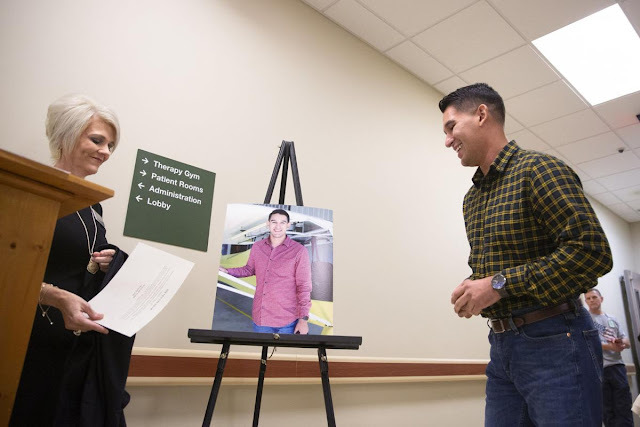 Amid the crowd of more than 50 gathered in the hospital hallway was his friend Niko Ramirez, who was diagnosed with a traumatic brain injury and left unable to walk or talk after a 2013 motorcycle accident. Doriann Kraatz, Ramirez's mother, said Salazar was consistently caring for Niko immediately after his accident, even driving themto medical appointments. She said it was in a doctor's waiting room a few years later that she remembers encouraging her son's friend to pursue his own career dreams. She learned that Salazar wanted to be a pilot and was looking into classes in Waco. "I said, Niko is fine. He is stable," she recalled. Salazar said that going through the experience with Niko and his family taught him to never give up hope. While his career plans may change, he said, he is trying to stay focused on being healthy and enjoying life every day. "I want to cherish the time I have with my friends and family and slow down a little." 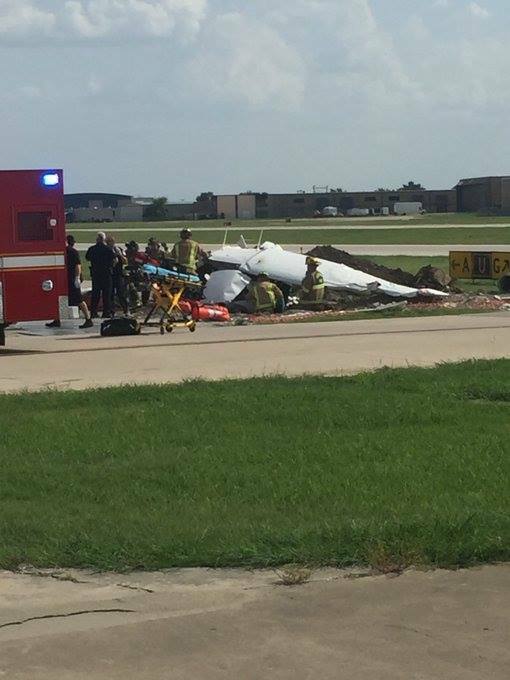 ADDISON, Texas—The National Transportation Safety Board is now investigating two plane crashes involving the same company at Addison Airport in less than six months. That company, known at US Sport Aircraft, was involved in a crash over the weekend and in March earlier this year. Fort Worth resident Sheema Shaik was involved in the March crash as a passenger. She said that she wanted to see Texas from the air, so she and her husband paid for separate flights with US Sport Aircraft through Groupon. But after taking off, a preliminary NTSB report shows that the pilot experienced a vapor lock with the fuel pump and radioed to the control tower that she needed to make an emergency landing. A vapor lock is when fuel changes state from a liquid to a gas while in the delivery system. The plane ended up crashing between a taxiway and a runway at the airport. What followed was a medical nightmare that left Shaik regretting the fact that she ever got into the cockpit of her plane. She received second-degree burns to her back, broke both legs and ankles, her neck, ribs, hand, and her lower back. Shaik said that she also got a concussion that was so bad, that she said she can no longer smell or taste things. The NTSB is investigating the cause of Shaik’s crash, and now they’re looking into another involving US Sport Aircraft. The company is now identifying as ‘Thrust Flight’ but acknowledges that it was formerly US Sport Aircraft on its website. On Saturday, a plane flown by the company went down at Addison Airport leaving three people injured. That’s two crashes in less than six months. Shaik’s attorney, Ron McCallum of McCallum & Associates, said he’ll be paying close attention to the preliminary investigation of this latest crash. “I’m deeply disturbed that there’s another crash—with the same company to which my client was almost killed,” McCallum said. McCallum and Shaik are considering litigation at this point. He alleges that Shaik’s crash could have been avoided. McCallum is a pilot himself and has dealt in aviation litigation for over two decades. He alleges that the pilot could have landed safely. “She had other opportunities available to her that would not have resulted in this type of injury, in fact, everyone could have walked away,” he said. WFAA reached out to US Sport Aircraft asking for comment about McCallum's comments, the crash over the weekend, and the one in March. “We are saddened by the accident this past weekend and are working closely with the FAA and NTSB to determine the cause and any measures that can be taken to prevent future incidents. We are grateful that all participants are receiving excellent care and are expected to recover. A Victoria man was injured in a plane crash Saturday in Dallas County. Steven Salazar, of Victoria, was aboard the plane at the Addison Airport and was injured, said Clara Ramos, of Victoria. She knows of him because he went to school with her daughter. Salazar is a certified flight instructor at US Sport Aircraft and Thrust Flight, according to his Facebook page. His family posted on Facebook that Salazar went into surgery early Sunday morning for his broken femur, tibia and lower spine. Salazar and two other people were in a Cessna C-172 small airplane that was departing Runway 15 at Addison Airport when it veered left while airborne and crashed into a taxiway, a plane transit area at the airport, just before 5 p.m., said Peter Knudson, spokesman for the National Transportation Safety Board. 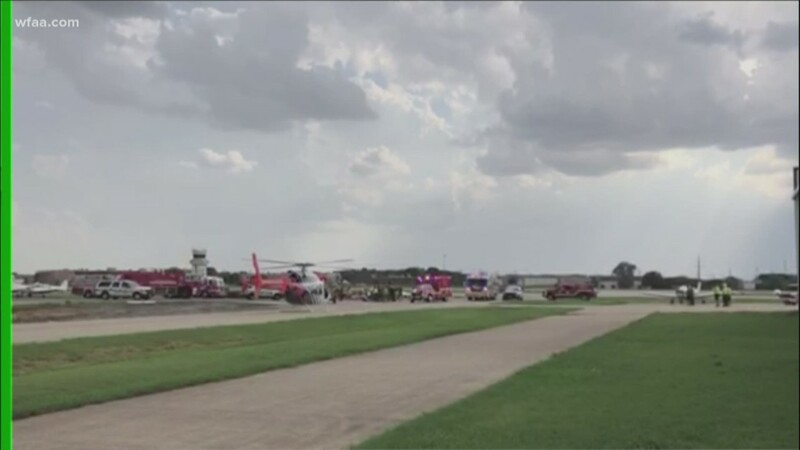 The three people on board were all injured and transported to Dallas-area hospitals, said Tony Molinaro, spokesman for the Federal Aviation Administration. All three of them are expected to survive and are in stable condition, an Addison Town Police Department officer said. Neither the NTSB or FAA releases names of those injured in crashes they investigate. The FAA and the NTSB are both still investigating. The plane was on a training flight, according to the Dallas Morning News. A small plane crashed at Addison Airport Saturday evening, injuring all three people on board, police say. The plane -- a Cessna C172 -- crashed just after it took off and veered into the taxi lane, according to the FAA and Addison Police Department. One of the three passengers was transported to Plano Medical Center, while police said they did not know which hospital the other two were taken to. Police did not know the extent of passengers' injuries. 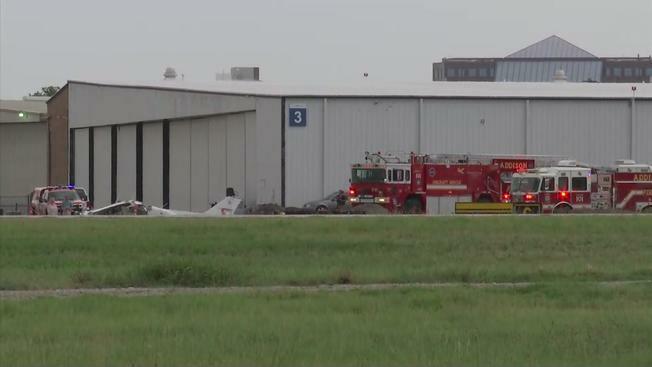 A small plane with the three people on board crashed at the Addison Airport on Saturday afternoon, a city spokesperson said. All three people on board were taken to the hospital, including one that was taken by CareFlite helicopter. Their conditions were unknown. The Cessna C172 aircraft was taking off at the airport when it veered left while airborne and crashed at the airport, Federal Aviation Administration spokesman Tony Molinaro said. The FAA was still investigating the crash Saturday night. Footage from the scene showed several emergency vehicles and a CareFlite helicopter near the wrecked plane. The Addison Airport is off Keller Springs Road and the Dallas North Tollway.